Recorded Barnes, U.K., Dec. 27, 1995. Recorded Bude, U.K., Aug. 29, 1993. Recorded Nottingham, U.K., Apr. 27, 1996. 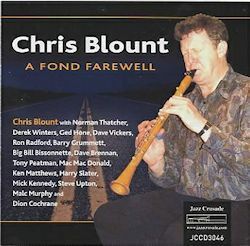 On the morning of December 18, 1998, the U.K. traditional jazz community awoke to a most unwelcome piece of news: clarinetist Chris Blount had died suddenly during the night. He was only 58 years old, but already he had established quite a reputation, having led his own New Orleans-style jazz band for many years and seen a number of recordings released on labels such as P.E.K. Sound, Raymer Sound, Lake, Jazz Crusade, and Music Mecca. The Jazz Crusade sessions had produced more than could fit on single CDs; so hearing of Blount’s passing, Bill Bissonnette, proprietor of the label, decided to release these unissued tracks as this memorial album. When Bissonnette decided to relinquish control of the Jazz Crusade label, it was acquired by Upbeat Jazz, and under the aegis of Liz Biddle the decision was made to reissue this CD with the same liner notes and numbering as the original. It is good to have these three sessions available again as they contain some excellent jazz from some groups that, collectively, are something of a “who’s-who” of British traditional jazz in the nineties. The first session is led by the late Norman Thatcher, another musician who died suddenly—and early—of a heart attack at the age 69 while vacationing in Turkey. His being influenced by Ken Colyer and Blount’s by George Lewis, not to neglect Vickers’ by Jim Robinson, means it is no surprise that the front line—and, complemented by the sympathetic back line, the group as a whole—is solidly New Orleans in sound. Thatcher’s muted lead, by plunger or derby mute, as on Carolina Moon or Doctor Jazz, or open horn elsewhere, deftly informs the dynamics that lend much interest. Blount weaves his magic around the two front line horns, and the rhythm section ably supports the others. Murphy lays down a New Orleans roll-off for the Salutation March, and the group as a whole handles the segue from the 6/8 time of the first four choruses to the 2/4 of the rest so that it comes off cleanly. Lovers of the New Orleans style will find the five tunes of this set very satisfying. The group in the second session (which chronologically actually precedes the first session) has no holdovers, other than Blount, of course. This set, unfortunately, falls short of what the first set delivered. Often the front line is rather tentative in its attack—almost as if there is some uncertainty of the tune and its chords. I would except Blount here, of course. He seems at times the only one who knows what is happening, the others being content to sit back and rely on him. One of the cardinal tenets of N.O. jazz, according to Jelly Roll Morton, is that the melody should always be present, but that is not always the case here. Take Four or Five Times, for instance—not knowing what they were playing, one might be hard pressed from the outset to identify the tune. Also on occasion the tempos are suspect—there seems to be some rushing in Get Out of Here, as an instance. Bissonnette tries to hard to sound like his self-admitted hero Jim Robinson, but he seems to have only the technical details, such as the glissandi, down. Hone is not a loud player and could have benefitted a bit from more volume from recording engineer Peter King—on the set or in the mixing. I’m not sure if the punters at Bude had to strain to hear him as one does here. However, I like what he does, and I also appreciate Dion Cochrane’s little fills and accents here and there. I regret not being more positive about this set, but it was a bit of a letdown, although still worth having. The final session is quite a contrast to the previous one. Perhaps this is due in part to the band’s being Blount’s regular group, all of whom know each other well musically. Thus Blount seems more relaxed in this combo and perhaps plays more like his model, Lewis, here than elsewhere. Radford and Winters are also comfortable in their roles and fully in command. There is a spirit to each track and the group is cohesive—just listen to Mama Inez—so that each track is rewarding. The piano is a little under-recorded, a slight flaw, but there is nothing wrong with what is played by Grummet and how. Overall this is a pleasing set and one that sets off Blount to advantage. It is also indicative of how much the traditional jazz community lost with his passing.